A city located about 50 kilometers (31 miles) south-south-west of Tokyo. Kamakura is often described in history books as a former de facto capital of Japan as the seat of the Shogunate and of the Regency during the Kamakura Period. “This is our first trip to Japan. We planned to come here about 4 years ago, but the Fukushima issues occurred so we put off the trip to Japan. 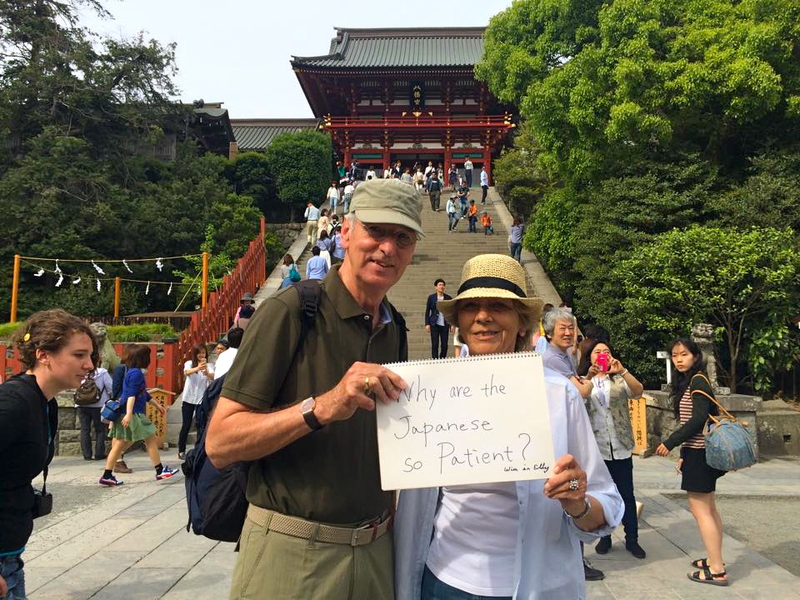 Question: Why are the Japanese so patient? 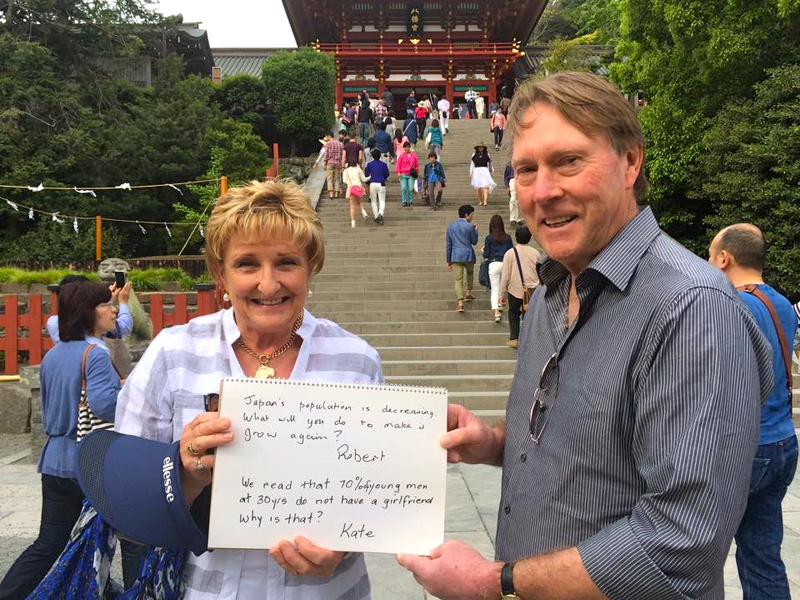 “We lived in Tokyo 35 years ago so we still have friends here. 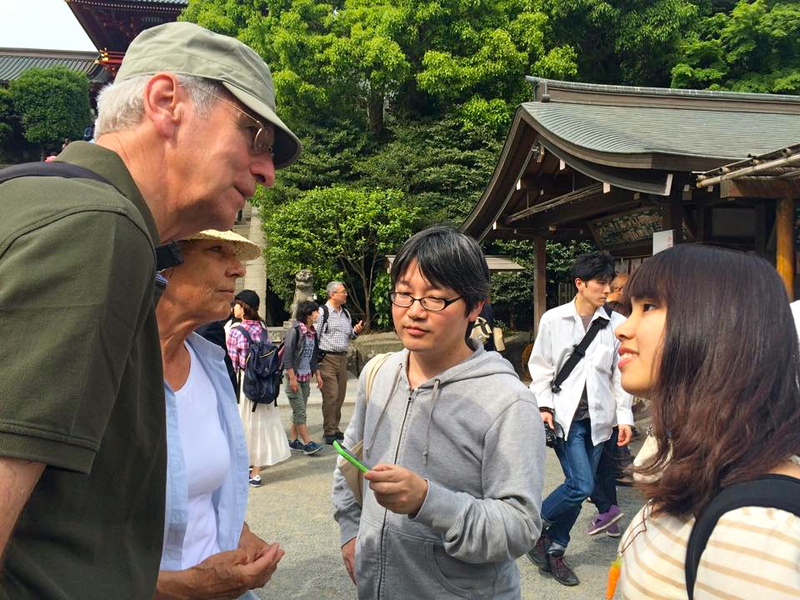 We came to Japan many times to visit them. 35 years ago, in 1980, younger people had more fun here. They enjoyed themselves more, had parties more. In Omotesando, there were Japanese rockabilly guys, lots of music and dancing. People were enjoying themselves at discos. It’s before karaoke. Japan has changed very much since even last 10 years. People are slower, no rush, quieter, fatter… they became like us. And they became more serious; they are thinking about jobs, they are always wondering like “Can I buy a house?”. Less people are getting married. 1. Japan’s population is decreasing. What will you do to make it grow again? 2. We read that 10% of young men at 30years do not have a girlfriend. Why is that? “This is our 1st trip not only to Japan but also to Asia. 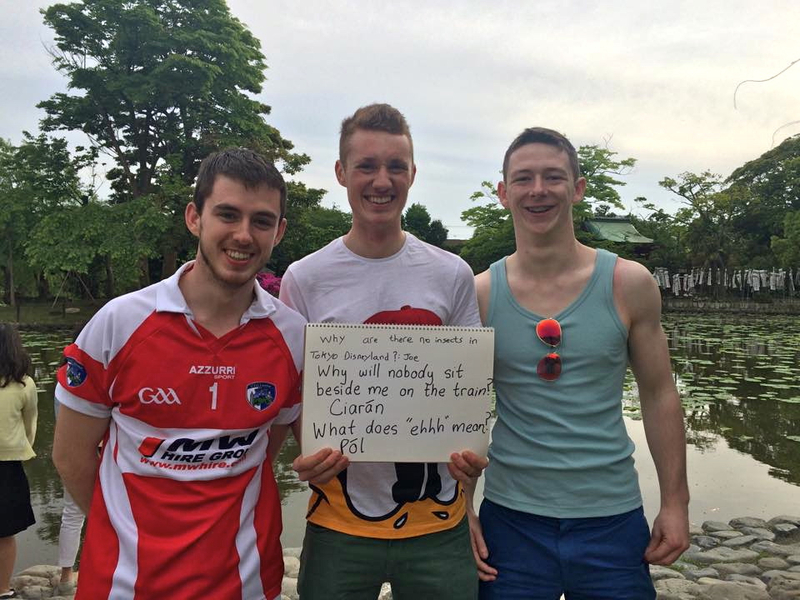 We’re students in Ireland and studying languages, such as French, Spanish and Japanese. 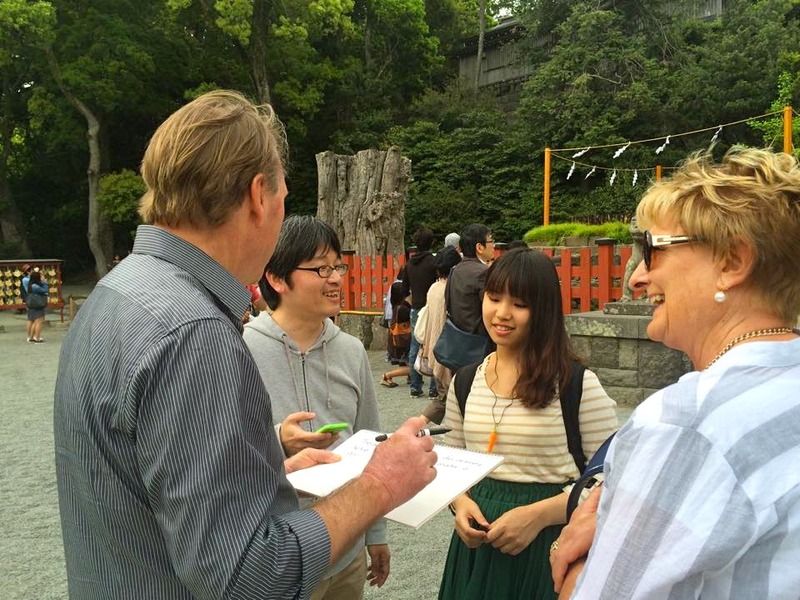 We’re taking internships at Japanese companies. One of us is working for an English school in Saitama, and two of us are working at Toyoko Inn, a chain of business hotels in Japan. That’s why we came here. We’ll be in Japan for 6 months, then one of us will go to Spain and the rest of us will go to France. 1. Why are there no insects in Tokyo Disney Land? 2. Why will nobody sit beside me on the train? 3. What does “ehhh” mean? 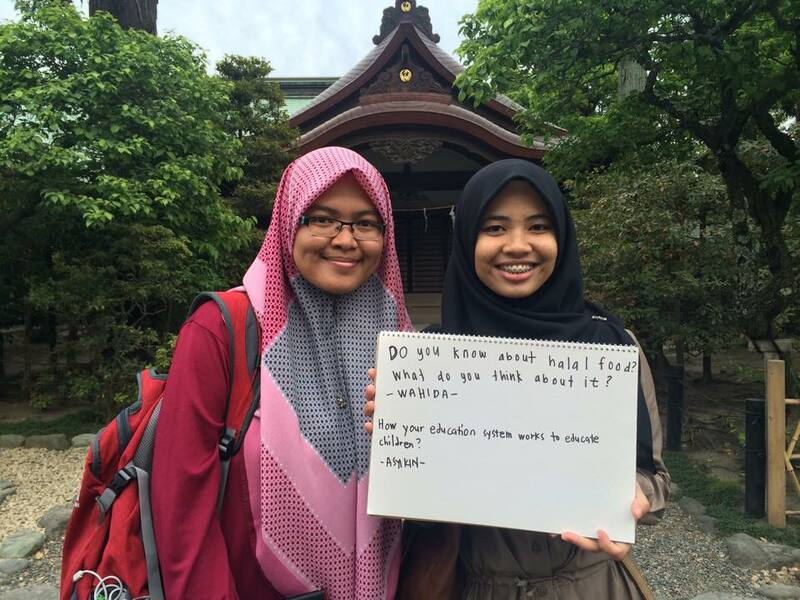 “We’ve heard that Japan is a safe place to study, so we came here. We learned a lot about Japan through anime, like ‘Chibi Maruko-chan’. 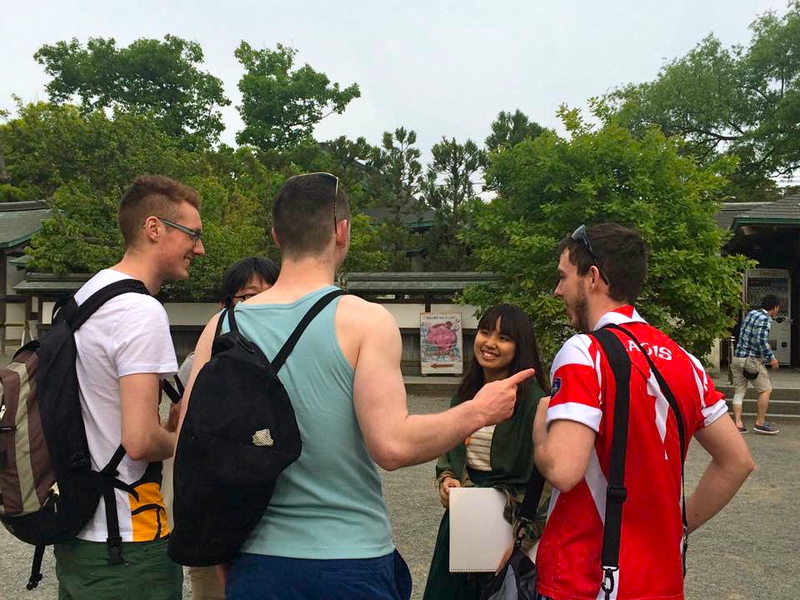 Actually Japanese people are very nice, very polite and very friendly. We were really impressed. Also Japanese people who sleep standing up on the train are very impressive for us LOL. 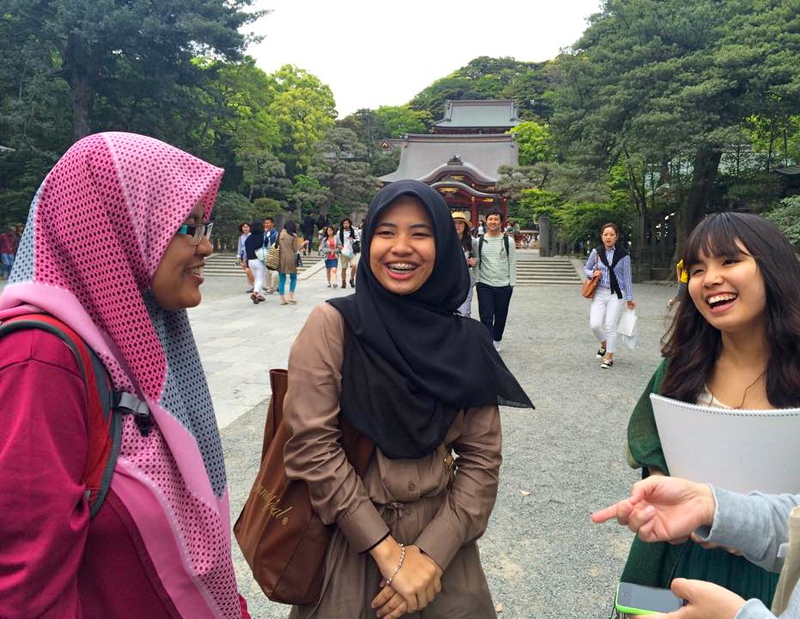 One of these girls says; “I wish I could have a Japanese boyfriend here!” → 3 girls were enjoying a girl talk! 1. Do you know about halal food? What do you think about it? 2. How your education system works to educate children?